"Can hip and historic coexist? #QuebecCity says, "Mais oui!" Quebec's capital has long drawn admirers to its historic district — the famed ramparts, quaint cobblestone lanes and handsome stone houses. But if you get swept up in its squint-and-you're-in-Europe charm, you'll risk missing out on a lot. @renaudphilippe took this photo for @nytimestravel in the Basse-Ville, or Lower Town, which is home to 2 massive trompe l'oeil murals. Their depictions of prominent Quebecers and life in the Cap-Blanc harbor district double as local history lessons. 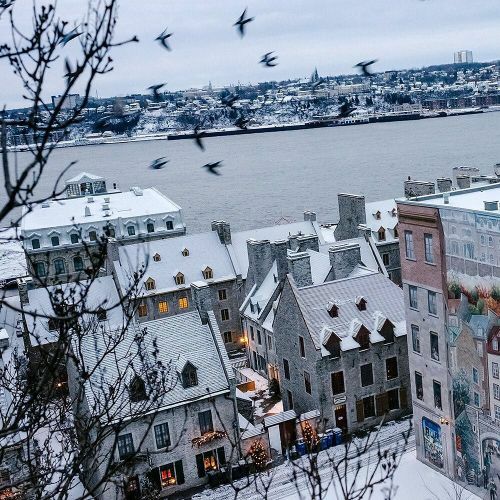 From the revitalized St.-Roch, home to secondhand and design shops, to Rue St.-Jean, where visitors can survey the province's craft ciders and beers, this Canadian city is alive with cultural and culinary enticements." By nytimes on Instagram.